I’ve been wanting to write a post about how my desire to live deliberately affects the choices Todd and I have made about our kids’ learning. Every time I think about writing about homeschooling/unschooling, though, I feel I need to offer several paragraphs of caveats and disclaimers. I can’t possibly address all of the angles of this complicated issue in one blog post, but I will offer just a couple of explanations before diving into what matters – how fun it is to watch kids learn. The first clarification is that I believe strongly in public education. I think it is a crucial foundation for democracy. I am happy to pay tax dollars to support it, and I am committed to advocating for quality public education by communicating with my local school board and with state and federal officials who affect education policy. I think that the vast majority of public school teachers are talented, dedicated people who have positive impacts on the students they serve. I also appreciate and respect the choices that other parents make to have their kids in public or private schools, and I know that most of these parents are very mindful about their children’s education. All of that said, it is also true that many aspects of institutional education seem unnatural to me, especially the increasing standardization. This is one of the main reasons we have chosen to homeschool. Among the many benefits of homeschooling, for me, is the way this approach helps me to be mindful and attentive to the individual ways my boys learn. Over the past month, Emerson has been taking important steps in his process of learning to read, and I am so grateful I am able to share these moments with him. Oliver learned to read at a fairly early age. He was our only child, and we had, of course, been reading to him since he was in the womb. We played with alphabet toys with him from the time he was an infant, saying the sounds of the letters as we did. We showed him how the sounds of the letters worked together to create the sounds of the words in the books we read with him. By the time he was three he was reading many short words in books along with us, and he was reading independently before he turned five. Emerson’s process has been different. He has loved being read to just as much as Oliver did, and he has also known his letters and sounds since he was about three. But, he has not been terribly interested in learning to read on his own. We have had a few sets of the “Bob” books – very simple, short phonics-based readers—around the house for years, and even a year and a half ago he could read the books in the first set with a little help. He was not, however, receptive to the idea of going beyond the small set of words that he knew from the Bob books or had learned from repetition and necessity. As we have worked our way through these short books, and several other simple early readers, it has been fascinating to watch his process. I can’t say I completely understand it. He will often come to words I expect will be challenging and read them immediately and fluently—words like “adventure” or “passengers.” But he also frequently has to stop and sound out words that he has read hundreds of times, like “then” or “was.” Listening to him read even a very short book can take a long time. I need to repeatedly, consciously tell myself, wait, be patient, don’t jump in, don’t correct. I think of all of those “extra” minutes that it takes to read these books as extra time to simply be with him. We almost always read on the bed or on the couch, snuggled together, and any minute added to the reading time is also another layer added to the association he is building between reading and feeling close and connected to people who love him. Even though it adds even more time to the process of reading a short book, I love that Emerson frequently stops to comment on the silly stories, or ask a question, or point out some detail of the illustration. I want him to be pulled into the book and the story. I am far more interested in seeing him enjoy reading because it feeds the imagination than I am in seeing him master reading as a necessary skill. As he reads, Todd and I give him clues and explanations, to help him figure out the words. (That “e” at the end means the “a” says its own name. or With that “o” and “a” right next to each other, you just pronounce the “o”. When I was a kid, we always said, “When two vowels go walking, the first one does the talking.”) These are offered as quick, casual comments, not as rules to be memorized and quizzed on. A few nights ago, Emerson paused after reading a past-tense word and said, “I’ve noticed that when a word has that “e-d” at the end, it usually sounds like “t.” Now, this is one of the things Todd and I had both pointed out to him during earlier reading sessions, but I was excited to hear him repeat the idea, describing it as something he had noticed. The more he experiences a new understanding about reading – or about anything, really – as his own discovery, the more he will internalize it, and the deeper his understanding will be. Several days ago, Emerson pulled out the sight word flash cards that came with one of the Bob book sets and, after looking through them for a few minutes, said, “These make me think of a game I could make.” At first I thought he had in mind some simple game involving just that set of cards. But no – he had an entire board game in mind. (I should have known, since he has created a few other board games before.) 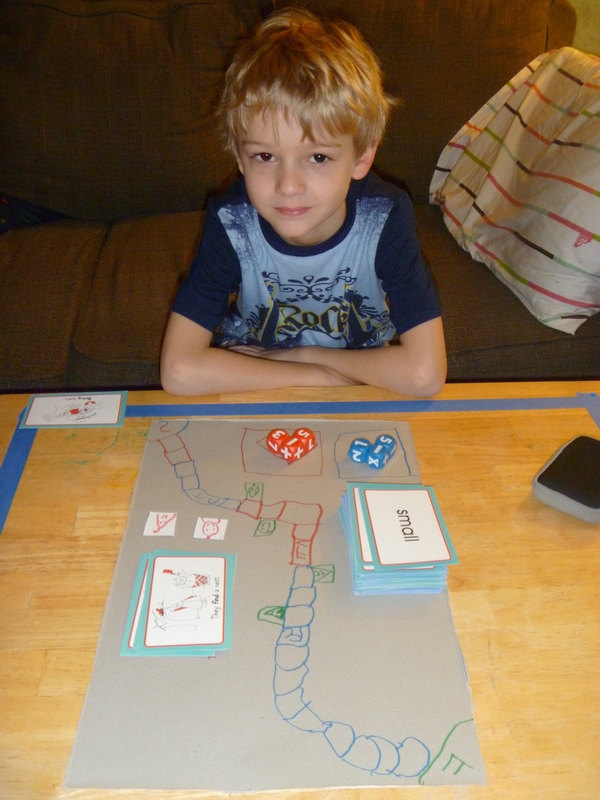 He got a big sheet of paper, some markers, the number and math symbol dice from his Number Ninjas game, and created the game pictured above. It involves rolling both sets of math dice, and reading the words and sentences on the flash cards. The number of spaces you move is determined by one of the math equations, or the number of letters in the word read or the number of words in the sentence read; the player gets to choose which one of those numbers he or she wants to use. The little squares on the side of the main path of movement spaces (the ones with smiling or frowning faces) give the players an opportunity to complicate their opponent’s progress in the game. As I played the game with him, I realized that it was more than just another way to practice reading and simple math equations. It also demonstrated elements of game design that Emerson has learned through all of his many, many hours of playing games with Todd and Oliver and me. This is another important part of our unschooling approach and of living deliberately – paying attention to how much kids are learning through everything they do, not just through activities that have a specific academic purpose. The learning journey we have embarked upon as a family may not pass every milestone that traditional educational institutions have laid out in the standard order or at the standard rate, but I’m grateful we have the ability to take this path. It leaves room for our boys to dance to the beat of their own drummers, and to find their own best routes to meaningful lifelong learning. I relate from my own learning to the way Emerson breezes past some words that seem complicated and then stumbles over some that seem simple. So many of those little words have strange pronunciations (the schwa of “the,” and the soft “th” sound on all those short words like “then” and “there,” etc. The little word “was” is a hotbed of strange ideas! In reading and writing music, there’s an enharmonic principle which allows for multiple representations of the same tone (f-sharp or g-flat, b-sharp or c, and so on), and I find sometimes that a different writing of a chord will make much more sense to me than the one given, so I write that version next to the printed one. I think another thing going on in Emerson’s game-making is a willingness to play with the symbols that represent the ideas and sounds and to make his own fun out of them. His process sounds healthy and delightful to me, and I’m so glad you’re creating space for him to have it.